After my son Levi passed, I found that I still had the parenting drive and I missed the kids Levi always brought around… So I began talking to parents about parenting college kids. I had a web site and blog. I wrote the 3 books for college aged kids and their parents and I co-authored one book on Leadership in College. With 32 years experience living and working on 3 continents as an international psychologist, author and speaker, what are your top three tips for others just starting out? Think out of the box and out of the world that you have known. There are so many opportunities but we need to think beyond our borders. I stress to our young people to do some traveling and become aware of other cultures. When you are young is the time to learn languages and experience another culture besides the one you were raised in. When we have experienced another culture we lose our narrow opinions of others. Tell us a bit about your book Losing your Only. My only child was killed in a car accident as a college student. He was my heart and the center of m world. We had moved all over the world and we were always very close. He had a very blessed life experiencing an entire lifetime in his short 20 years. LYO is written to parents or families that have experienced the loss of an only child. Losing a child is difficult, it probably tops the list but losing an only child, ratchets it up a notch. When I was looking for answers, I did not find anything written that could help me down this path, so when I finally came out of deep grief, I knew I needed to write this book. The book draws on your own personal experience. Was it hard to write about something so close to your heart? I shed a few tears, but in many ways they were tears of reliving a life that was so much fun and you don’t realize how much fun it was until it is over and the opportunity is gone. I can smile and laugh at all the Levi memories and I can feel the joy of having the experience of being his Mom. The difficulty came in finding the correct voice for the book. I did not want it to be a memoir. It was so easy to slip into wanting everyone to know Levi. My purpose of the book though was to help parents through the grieving process so they had someone that could give them some kind of blue print. It is not the same for everyone but it sure helps to have some kind of guide. I had not idea how long the grief would last. Now I know there will always be some residual grief, but the deep grief takes years. For me, it was 6 years. You also have lots of charitable interests. While in Shanghai, you founded “Lifeline Shanghai”. Please tell us a bit about it. I have been a social worker my entire career. I got my doctorates in Counseling Psychology in the 90’s. I have worked in most fields of mental health. I was a trailing spouse. We moved a lot so I had a varied resume, lets put it that way! But when I arrived in Shanghai in January 2000, I hit a niche. I was the first western psychologist in a community that was very high stress with more than its share of mental health issues. I quickly need help in times of emergencies. Many evenings we would be going out and the phone would ring. Larry would sit down and wait for me to hang up and then ask, so where do we need to be. I was the life line with the medical docs I had befriended in Shanghai. So we got together and LifeLine Shanghai was born. It is a call center for the expatriates or English speaking community of Shanghai. You're currently in the middle of a virtual tour to promote your book. What other stops are on your schedule? I am scheduled to be on Oprah next week and the Ellen Degeneres Show. The View is tentative if I have time in my schedule before I go back to Shanghai. After that, we will have to see if Hollywood calls. I want everyone to live with intention and appreciate what you have today. Many of us are working always in the future. We forget about today. Do not let a life event give you the lesson to appreciate what you have. It is okay to prepare for the future but know that all the planning in the world may change if the Universe has a different plan. I lost my only child, but I can say, I have few regrets. I miss him but he is still with me in many ways. 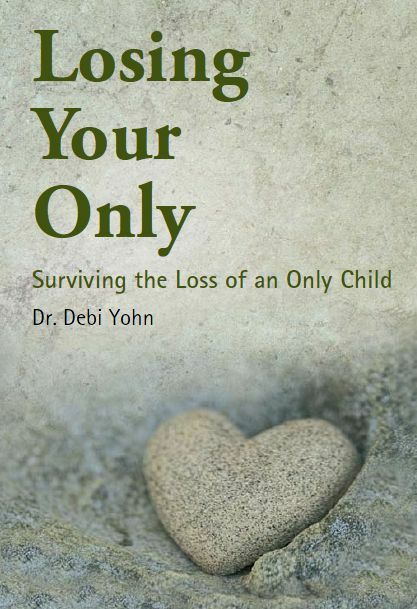 Thank you for your interest in Losing Your Only, by Dr Debi Yohn. This is a very personal story which helped Dr Yohn discover her purpose – to motivate and support parents and others to live life to their highest potential. The digit version of the book is currently available at http://losingyouronly.com/get-the-book/. If you would like to be notified about the upcoming print and audio release, please visit this page and send Dr Debi your name and email address.